Standard Starfleet rules and regulations apply throughout the ship. However, due to the unique nature of the fleet, some additional guidelines have been implemented. An “open door” policy is in effect across the fleet. All crew members are welcome on all ships and may make full use of the facilities found there. 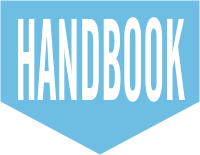 Crew visiting other ships should remember to log in and out so that their whereabouts is known in case of emergency. It should be noted that some areas on ships may be restricted and crew members should not attempt to enter an area for which they do not have clearance. Due to the high risk nature of the work undertaken by the fleet, families are not permitted on board, except while the ship is docked. There are good facilities on Starbase 24 or Frontera and it is suggested that any crew member with family, apply for quarters there. A school has been established in Frontera City for the children of serving Starfleet officers and offers excellent educational standards as well as having both long and short term boarding facilities. Allowances will be made for a limited number of pets. Any crew member wishing to bring pets on board should apply to the captain for permission. All pets must be neutered and have up to date vaccination certificates. Tribbles remain banned. 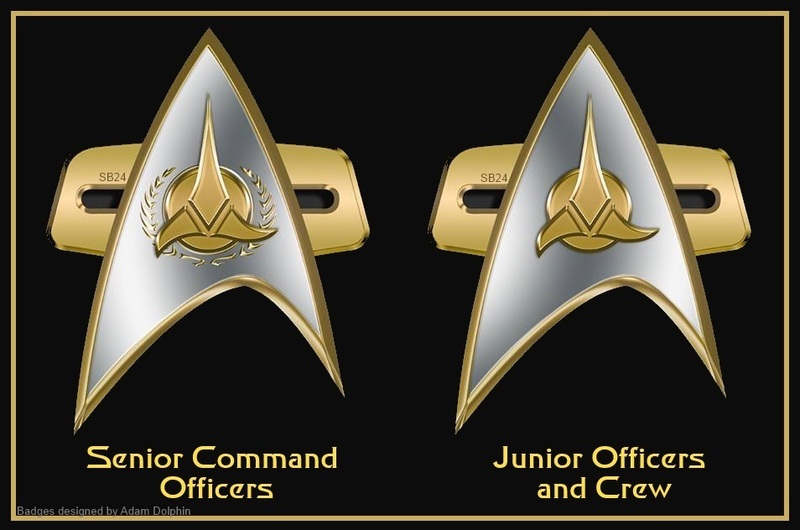 As the Rapid Response fleet is a joint Federation/Klingon operation, all crew are expected to wear both Starfleet and Klingon rank insignia on their uniforms. 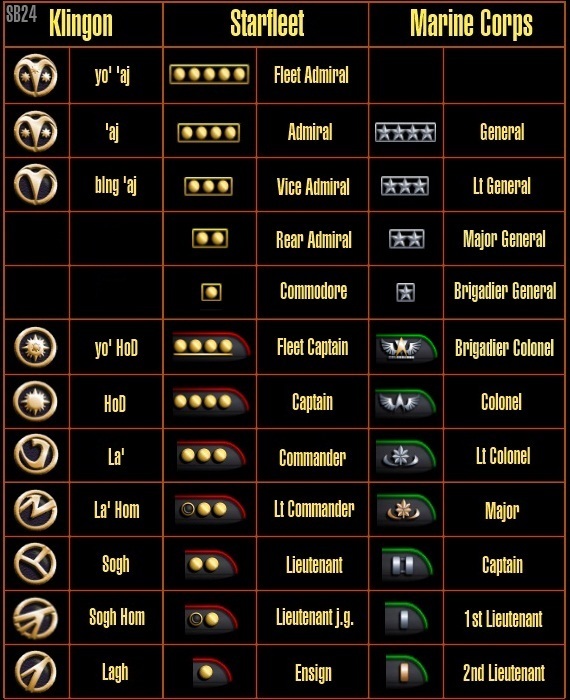 Both Starfleet and Klingon Marine officers may wear Marine Corps rank insignia but are also expected to wear the equivalent naval rank insignia. 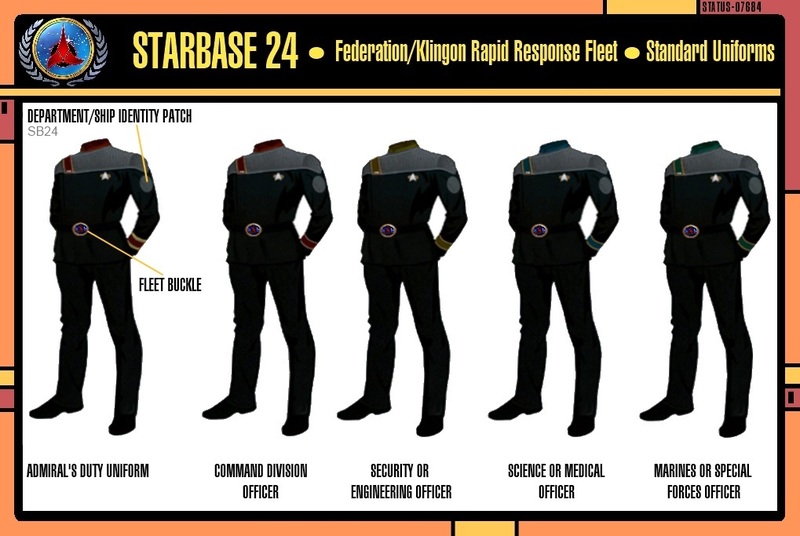 As of December 2382, a new uniform has been approved by Starfleet Command for the staff of Starbase 24. This uniform consists of a black crossover jacket in black gabardine with a grey quilted top. The jacket is fastened by a shoulder strap in department colours, with black stripes to indicate the rank of the wearer. The sleeves have a band in department colours with rank pips. A patch on the left sleeve indicates specific department or ship. Holographic personnel wear their mobile emitters on the right sleeve. Plain black straight-legged trousers and black ankle boots are worn with the uniform. Female staff may wear a straight knee length black skirt and long boots. Marines, Special Forces and Security Personnel are permitted to wear black combat trousers/cargo pants and combat boots. It should be noted that some civilians in key roles have been given honorary rank in order to allow them to carry out their duties. Honorary rank is indicated by grey stripes on the shoulder strap and silver rank pins on the sleeves. Any crew wishing to wear non regulation items with their Starfleet uniform must apply to the captain for permission. This includes, but is not limited to, items such as Bajoran earrings and Klingon d’k’tahgs. uniforms. 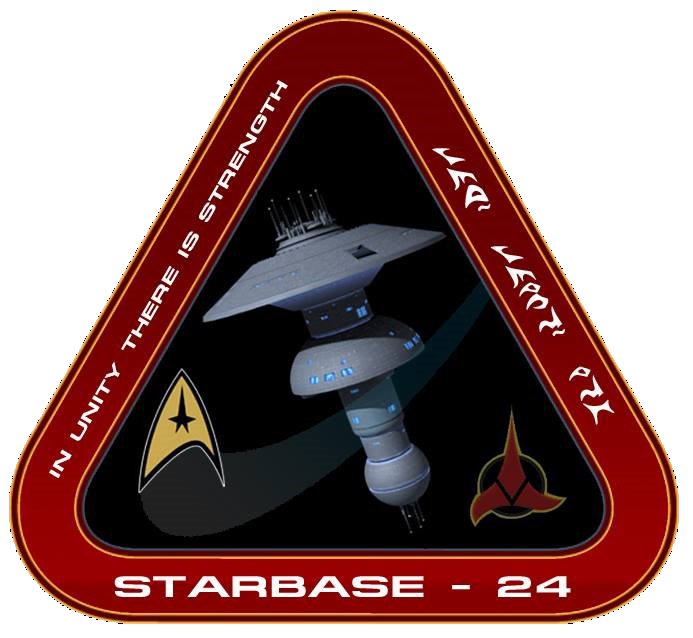 Starbase 24 also has a unique Comm Badge, featuring the Klingon emblem engraved in gold in its centre. Senior command staff are distinguished by the laurel leaves framing the logo. The facilities on board the Starbase are available to crew of all ships within the fleet. However, it should be noted that during the two hour overlap period of each shift, the holodecks are reserved for staff training and development. A wide selection of classes are available. Information on these may be found on the bulletin board or see the Recreation/Training officer for further details. The Ten Forward Lounge is an informal area where the wearing of uniform is not required, neither is it necessary to address officers by rank. Due to the presence of holographic crew members, Starbase and the fleet have been kitted out with holographic emitters on all levels. The Starbase holograms have been on active duty for several years and are to be treated with the respect due to any other crew member.